A few days ago I came back from vacation and had a desire to cook. So I opened up the pantry and found one of my favorite ingredients – cream of corn. I really wanted soup and 15 minutes later I had Chinese Corn Soup. 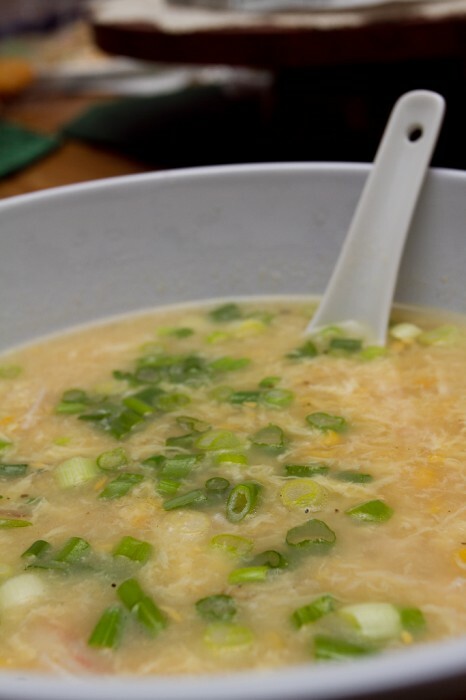 This is like egg drop soup but sweeter and has a few additional ingredients like shrimp and scallions. It’s really easy to make and the shrimp can be substituted with really really thin slices of chicken, scallop or crab meat . Begin by heating up your stock pot ( I used my wok naturally). When the pan gets hot add your oil. Once you oil is hot, saute the garlic for 30 seconds until slightly brown. Next pour in the chicken broth, 1/2 can of cream of corn, dissolved corn starch and bring to a boil. While soup is boiling, crack and beat the egg in a bowl and clean/prep your shrimp. You can also wash and cut your scallions at this time. Once boiled, reduce the heat to medium-low. If the soup is too thick, add some water or additional chicken stock. If it is not thick enough, add more cream of corn. Add the salt and pepper and check for taste. Adjust accordingly. Once you are satisfied with how the soup tastes, pour in the egg and stir until the egg is evenly distributed throughout the soup. We are not going for scrambled egg consistency here so make sure not to overcook it too long. Once the egg gets to about 90% done, add the 4 shrimp. Cook the shrimp in the pan until they turn pink and are just cooked. Turn off the heat and serve immediately. Feeds up to 4 people in a traditional family style Chinese meal. Note: You can also substitute Chicken or scallop instead of shrimp. If using chicken, make sure it has been very thinly sliced so that it cooks quickly(think of hot pot chicken slices). If using scallop, make sure scallop are seasoned lightly with salt/pepper and have been patted dry with the foot removed; scallop overcook more quickly than shrimp so be aware. If using crab meat, just mix it through until heated.